Oscar Pistorius returned to court for a pre-trial hearing in South Africa this morning, for the first time since being freed on bail over the killing of girlfriend Reeva Steenkamp. During the short hearing at Pretoria Magistrates Court, a judge granted the prosecution extra time to complete their investigations and gather evidence. The controversial case has been postponed until August 19 following an agreement between the prosecution and the defence. This means it may not come to a full trial until next year. 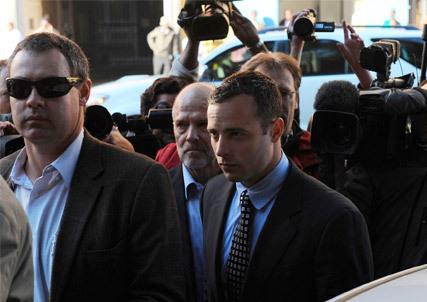 Appearing in court, Pistorius wore a dark suit and was reportedly ‘calm’ throughout the session. He spoke only to confirm he understood the hearing had been postponed. Both his brother and sister and coach, plus other family members and friends were present. After adjourning the case, South African magistrate Daniel Thulare warned against ‘trial by media’ of the medal-winning double amputee, and said he was ‘worried’ by some aspects of reporting into the case. This comes after graphic pictures of the crime scene and bathroom where Reeva Steenkamp was killed were leaked, and published by several news outlets.